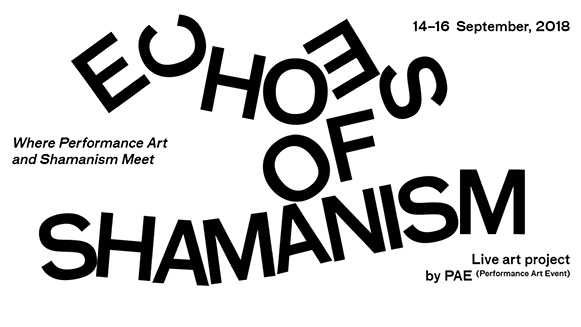 Echoes of Shamanism is a 3-day event presenting artists who use shamanic practices either in their public performances or as a method for the preparation of their artworks. 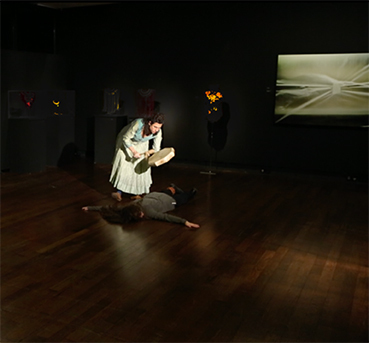 Artist Nina Boas noticed a recurring use of shamanism in contemporary performance practice. Space will be given on Friday, late afternoon, for artists to explore their different approaches to shamanism in performance. There will also be a lecture by philosopher Fons Elders to contextualize shamanism in performance. 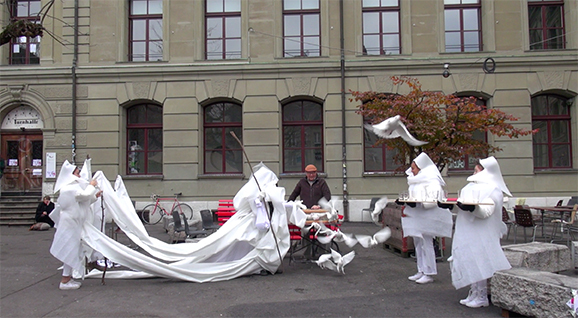 A full program of live art will take place on Saturday afternoon, both inside Het Glazen Huis and outside in the park. Sunday is the aftermath, a moment for audience and artists to reflect on their experiences. Born and raised in Moscow, Birger was greatly influenced by Social Realism and imperial Stalinist architecture. The monumental arrangements inspired admiration, humility and wonder, similar to the visual impact of sacred formations. As a result, she is strongly interested in the visual strategies and formal principles of different religions, cults and totalitarian regimes, and incorporates them in her work. Like she did in her work, The Book of Happiness and Sadness, made in 2018.Alongside Birger’s performance this book, which is a 8:35 minutes video, will be screened during the days. The video is based on one of Birger’s drawing diaries and her participation in Ayahuasca ceremony. Ayahuasca is an entheogenic brew made out of Banisteriopsis caapi vine and other ingredients. The brew is used as traditional spiritual medicine in ceremonies among the indigenous peoples of the Amazon basin. While scrolling through the pages of abstract drawings in the book, she recites her psychedelic group experience. The narrative and the patterns in the drawings mimic human interdependency and the significance of belonging to a group versus individualism. The Book of Happiness and Sadness is sponsored by the Mondrian Fund. Since 2016 Griepink has been rooting his ephemeral and shamanic performance-based practice back into the earth by involving (social) permaculture and community practices into his work. This was followed by durational land-art pieces, such as Grove 2.0 – Chapel of Wild Wisdom, a futuristic druidic greenhouse in a public woodland area. Upon ending various pilgrimages in the tropics he returned to European soils seeking to reanimate and explore local ‘indigenous’ knowledge for the sake of getting at the roots of colonialism and global capitalism. With his recent anti-capitalist and pro-pagan spoken-word piece, Ultra Ecosexual Polyamory. 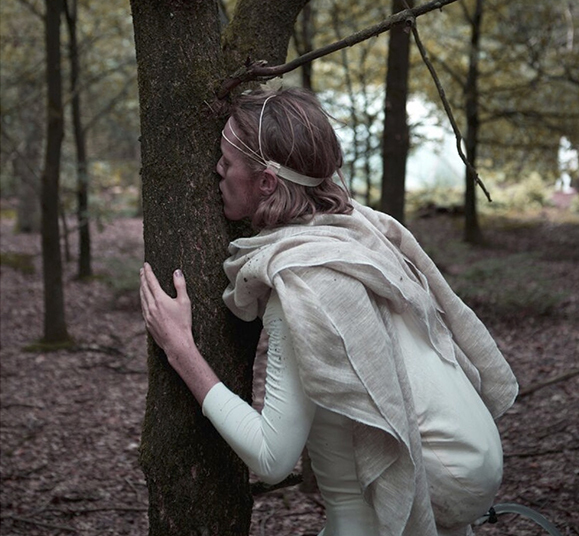 Permaculture ASAP, he looks to revive the oral tradition of the Druidic Bards (or Greek Rhapsodes) in a contemporary way, forwarding eco-sexuality as nature’s unorthodox spirituality. Embedded in this Renaissance of matriarchy is social justice, ending racial bias, empowering creative expression, embodying ecstasy and restoring the ecological homeostasis on the planet we cohabitate. The work entitled Mother sea is a collective call to experience the primordial birth. Starting from the present where Life is patented and sold as a commodity, and with the use of video, voice and narration artist and participants will call out to the ancient waters and try to travel past time and connect to the mythical times of the Great Beginning. Living and traveling in South America, Manoussakis creative practice has been inspired by her work with Shamans from Mexico, Columbia, Peru and Brazil. By bringing the ceremonial process to the fore, her work is inviting the viewer to collective moments of exploration, and to actions that we could also call rituals or prayers that are formed with the use of shamanic and artistic tools. Sanctity, Purification, Solitude, Seeing true self, Healing, Rituals, Meditation, Filtration, Catharsis, and Attaining a state of blissfulness make up the central elements of this performance. Shah’s performance is basically about attaining catharsis through various ritual processes. These rituals are of everyday practice in Jain Culture. They are meditative processes through which one slowly enters into a deep state of consciousness and slowly experiences blissfulness. This performance will focus on both one-to-one and community interaction and healing. An important part of the rituals is to involve all five senses. Through the process of ritual, mind, body and soul enter a higher state of understanding. Material used in ritual will help to intensify the process of achieving the desired result. 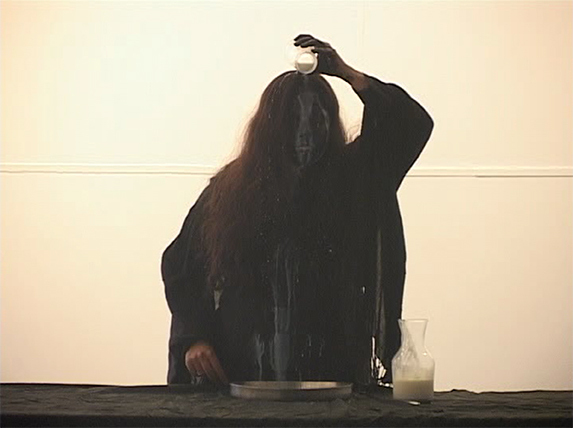 Shah wants her audience to experience a ritualistic process and have an experiential moment. A k u z u r u is a performance and trans-disciplinary artist from Trinidad and Tobago. The human and natural world has catalyzed her study of the metaphysics of movement and gesture, the vastness of space, and shamanistic inferences. Mystical nuances are deeply felt through her experimental sounds, concept clothing, tableaux vivants, monumental drawings, and writing. Her productions in the famous multi-layered performance traditions of the Carnivals of Trinidad and Nottinghill, UK, have been vital to her emphasis on processional performance as a profound dynamic art form. 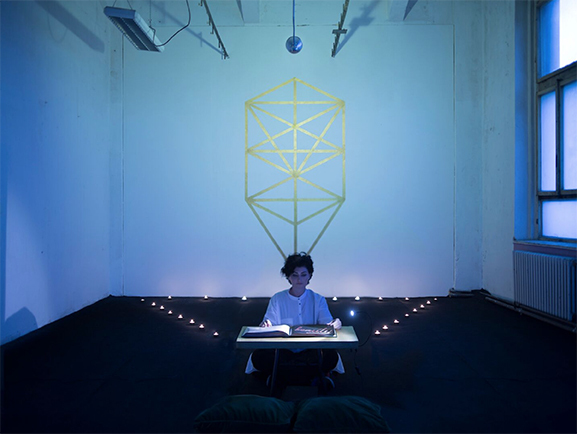 Her conceptually and physically intense interactive Experiential Art Productions leave an indelible memory, activating energy processes through visceral situations and engagements. Newton’s space-time paradigm severed the umbilical cord between nature and culture. Such a radical divorce never happened before. Quo Vadis? exists of an unbroken material connection between every human alive today and every one of our ancestors – even to the very origin of living matter, to the very first primordial cell. Quo Vadis? implies research about perceptions, realizing that self-liberation can’t be a self-centered issue. Why? The small ‘self’ comes from somewhere and goes somewhere. 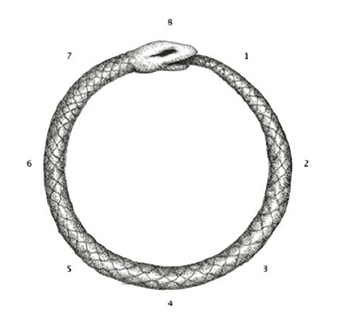 Ourobouros, the symbol of regeneration, bites its own tail. No salvation through ego and egocentrism. Let’s act for the common good. Creative imagination is not identical to fantasy in the ordinary meaning of the word. Empiricists may criticize imagination in favor of facts, but creative imagination in its full capacity, like with Wolfgang Amadeus Mozart or Niels Bohr, has nothing to do with wishful thinking or delusions. Creative imagination is not a homogeneous operation of human intelligence. On the contrary! It is an act of seeing and grasping ’reality’ simultaneously through spontaneous intuition, abstract reasoning, pragmatic intelligence, instinctual knowledge, personal sub-consciousness and collective unconsciousness. Patience is the most important virtue of the Dogon. PAE is artists Nina Boas, Martijn Stellinga, and ieke Trinks, who organize events that give priority to visual art practices intended to be experienced live. The first PAE event took place in 2008 in the Wolfart Projectspace in Rotterdam.